How's your week going? I just returned from visiting my mother. She turned 91 years old on March 14th. My sister and our husbands took our mom out to a nice dinner and after we came home from the restaurant we celebrated her birthday with these cupcakes for dessert. I put a candle in one of cupcakes and then she blew out the candle out and made a wish. We all had a great time laughing and celebrating the life of such a remarkable lady. Last Saturday was Sweetheart's birthday. 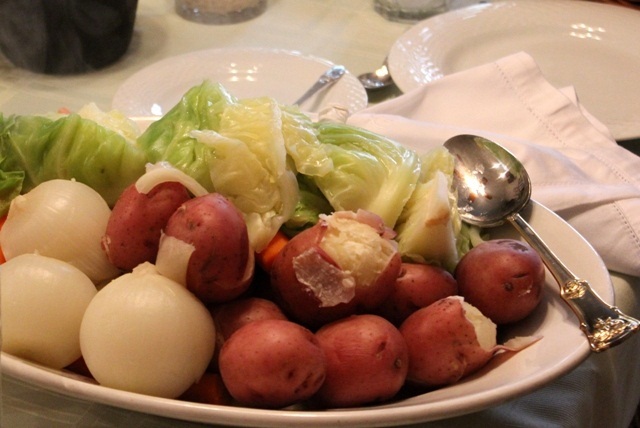 We invited our children over for Corned Beef and Cabbage to help celebrate Sweetheart's 70th birthday. Of course he did all the cooking. He is a marvelous chef. Just is time for St. Patrick's Day we love to take on some Irish classics. 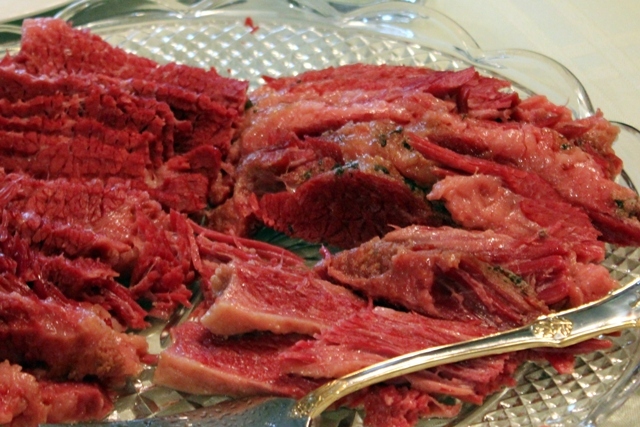 The bedrock of a great St. Paddy's menu is corned beef and cabbage with boiled red potatoes. 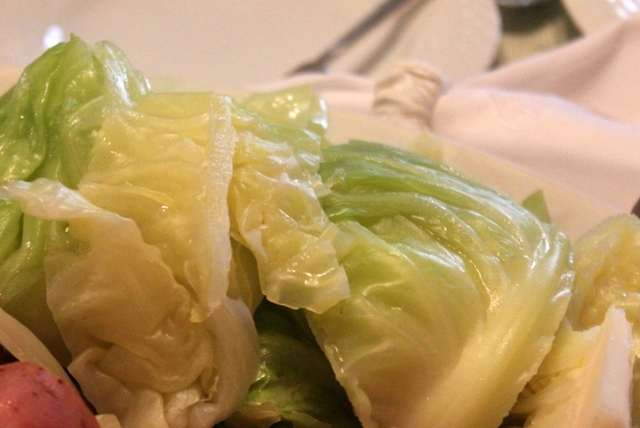 The cabbage is boiled separately in clean salted water just before serving the corned beef. 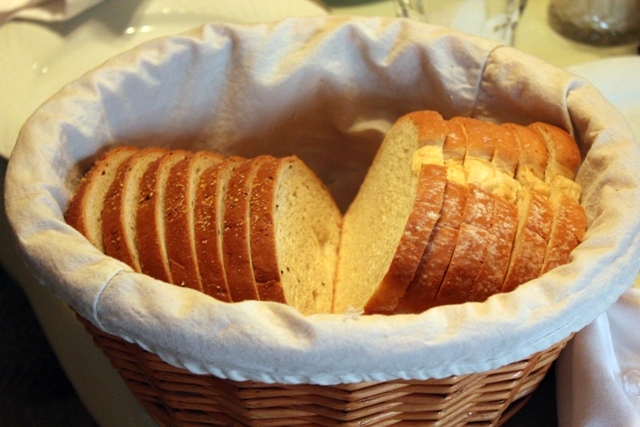 Fresh bread and butter is always a wonderful addition to any meal. I took a suggestion from Designs by Gollum for exhausted cooks and made the cupcakes from a Devil's Food Chocolate Cake Mix and prepared Vanilla Frosting. A piece of Belgian Chocolate on the top of the cupcakes finished the dessert. Cupcake papers are from Tuesday Morning. I hope partaking of this special menu on March 17 will bring you the luck of the Irish, enough to ward off any curses that may befall you...and that's no blarney. OMG! All that food! I would have loved to be at your dear mom's birthday party, wow, 91! God bless her. I'm drooling over this entire menu, food and desserts, specially those gorgeous cupcakes! Beautifully displayed too. Have a happy weekend. Looks very yummy. I love the desserts and the way they are displayed. Thia is a wonderful dinner. I love you cakestand. I drool with your cupcakes too. 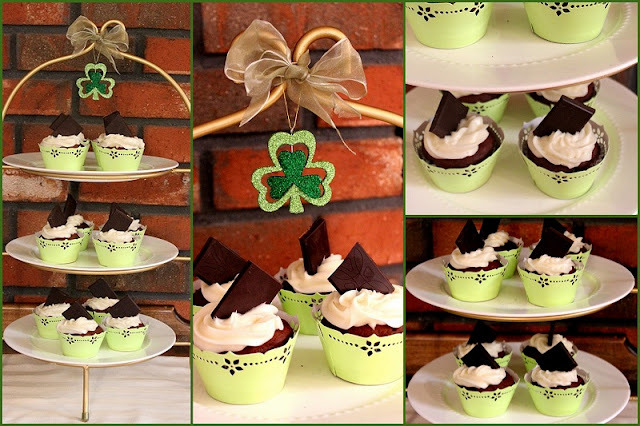 Pls visit: http://simchieinspires.blogspot.com/ to see my contribution for St. Paddy's. Oh my goodness, yum yum yum! We are having our irish meal tomorrow! I can't wait!! Happy St.Patricks Day and PS!! Mmm...what marvelous looking cupcakes! Yummy. The meal looks wonderful, Betty. Belated birthday wishes for your mother! Tummy filling!! Visiting late for Pink Saturday. Green Goodies, is my entry. Please come by when you get a chance. Have a great week ahead.